In China, crossbows can only be carried around with a permit and failure to do so can result in five days behind bars and a 500 yuan fine. In China, crossbows can only be carried around with a permit. 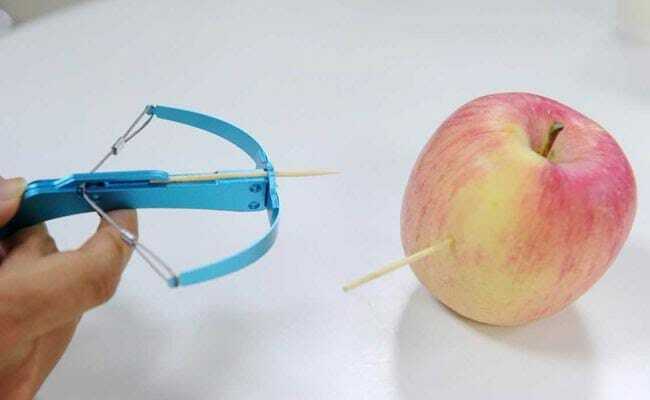 Shanghai, China: Chinese authorities have raided toy shops across the country to enforce a ban on a handheld crossbow popular with children that can fire nails and needles, state media said.So-called toothpick crossbows were designed to shoot just that -- toothpicks -- and in recent weeks became the must-have "toy" for young children in Chinese schools. But anxious parents said they feared the devices, made of plastic or metal and costing as little as five yuan ($.75), could end up blinding somebody after reports that people were swapping toothpicks for metal needles and iron nails. Now authorities have acted, according to the official Xinhua news agency, which declared late Thursday that the mini crossbow has "vanished from shelves almost as fast as it emerged". It quoted one worried Beijing parent surnamed Geng saying: "This is more a time-bomb than a toy." Xinhua also quoted an unnamed inspector with the Beijing municipal bureau of commerce as warning: "Kids are being watched by teachers and parents. Playing with such a toy will not be tolerated. It is too dangerous." The crossbows have also been pulled from major shopping websites, the agency said, adding that only one injury had been reported in connection with the crossbows in all of China. In China, crossbows can only be carried around with a permit and failure to do so can result in five days behind bars and a 500 yuan fine, Xinhua said.